And we did it all without having to write a brand new piece of content! In this post, we’re going to show you EXACTLY how you can use your existing content to achieve the same results. That may seem obvious, but unfortunately, those happen to be the two things content marketers and SEOs struggle with the most. Thankfully, we have a step-by-step solution that will help you solve this problem once and for all. The Bike Pump Technique is an in-house solution that can have a massive, speedy impact on your content’s traffic, backlink profile and conversion rates. You don’t have to reinvent the wheel! You simply have to pump new life into existing content that shows potential. You’ve already created content that vastly outperforms other content on your site. Don’t worry, the numbers don’t have to be stellar—just above average. We’ve found that a small portion of just about every website’s content simply tends to outperform the rest. These content outliers show up in more searches and rank for more keywords than other content on your website. More often than not, this success is accidental. Sure, it’s possible some of these content outliers are more heavily researched and well-written pieces. It’s far more probable that this content simply stumbled on the right keywords and meandered into above-average coverage of a topic that happens to attract a greater number of search queries. In fact, this was the case with some of our content. And that’s what drove us to create and implement The Bike Pump Technique. When analyzing our own content, we found that some pieces we would have never defined as our best work were earning far more impressions and prominent search rankings than we expected. As noted in the name, the piece included 8 statistics about responsive web design found around the internet, and was 355 words long. We didn’t expect for it to be any more or less successful than any other piece on our blog. But over the course of the next two and a half years, it shattered expectations. It gathered 8057% more impressions than the average across all our blog posts. No, that’s not a typo. The piece also earned 25 backlinks over that time span, with no content promotion efforts. If that sounds abnormal, it’s because it is. We weren’t capturing nearly enough traffic based on the amount of impressions the piece was getting. The traffic that was hitting the post was bouncing at a rate of 80.60%, meaning most users were leaving the page without viewing any additional pages. The backlinks we had received were mainly from content marketers wanting to incorporate our statistics into their own content. The piece had ranked for lots of keywords and was earning crazy amounts of impressions relative to our other content—but barely anyone who came across it in SERPs was clicking on it. Many of those who did ended up bouncing because the piece didn’t fulfill the needs of their search query. Thankfully, we didn’t see this as a big miss. We saw it as a massive opportunity, and capitalized on it. That’s why we were able to massively improve the page in just about every key metric. You can do the very same thing, and we’re going to show you how in this step-by-step guide. The Bike Pump technique is all about finding your high-potential outlier content and making it better. Even if you have a low traffic website, there’s always opportunity and potential if you have a body of work. Not to mention, this is an outstanding way to turn a low traffic website into a high traffic one! Here’s how you find your winning content outliers with the help of Google Search Console. This process is aimed at finding the keywords that are providing you with a high number of impressions and a low number of clicks. This high impression, low click relationship is known as a low clickthrough rate (CTR). The keywords we will identify are tied to specific pieces of content, so we can use this information to figure out which content on your site is driving impressions but failing to get adequate numbers of clicks, or failing to convert those clicks into something more. Open up Google Search Console and select a property. 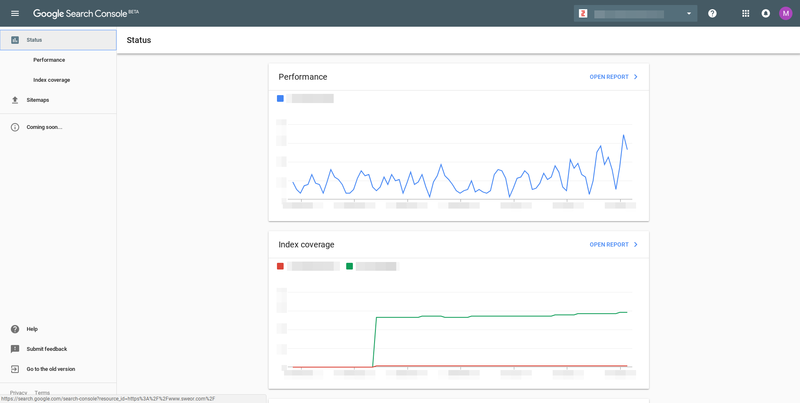 After the Search Console dashboard loads for a given property, make sure you’re using the new version of Search Console. 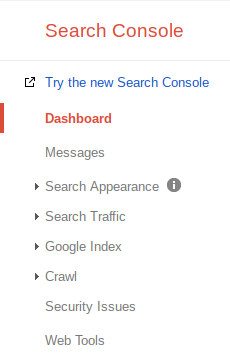 If the legacy version loads, simply click on "Try the new Search Console" link at the top of the left hand column. 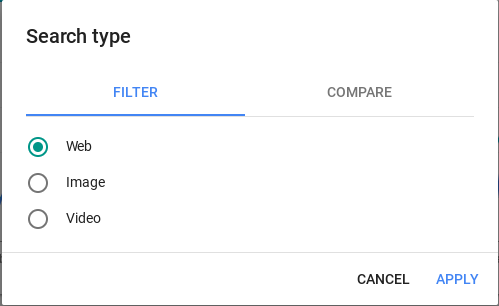 Within Search Console, click on "Performance" in the left hand column under the "Status” header. 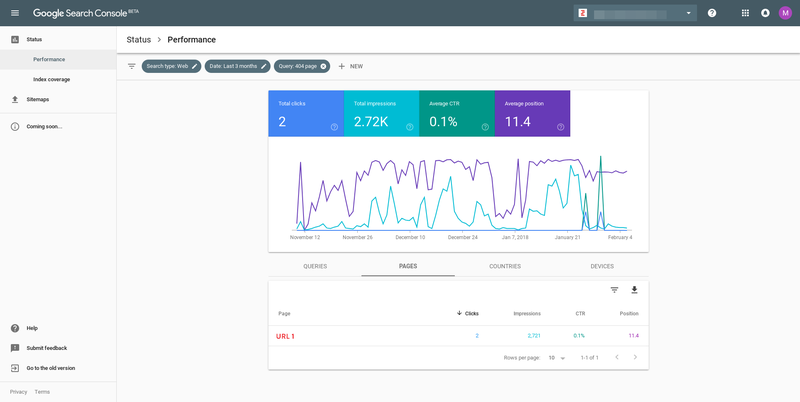 Once on the Performance report screen, a default dashboard will load which shows the clicks and impressions by query for web searches over the past 3 months. Adjust the "Search type:" (web, image, or video) and the "Date:" filters as you see fit by clicking on the pencil icons. For our purposes, we’ll stick with the default search type and date range. Click on the "Average CTR" and "Average Position" tiles above the graph on the Performance screen. As you click on these tiles, they will be highlighted with a color, and you’ll see the metrics plotted on the graph as well as the table below. Scroll down so the chart is fully in view and make sure the chart display is set to "QUERIES"
Click on the "Impressions" column header to sort the chart so the queries with the greatest number of impressions are displayed first. If you scroll down, you’ll find all of your search queries sorted by the number of impressions they receive. Now, look for the queries with the largest number of impressions. Make note of queries with an average position on the first three pages that have a low number of clicks. In other words, any queries with an average position on the first three pages (1-30) in the “Position” column), but a CTR lower than approximately 1.25% are underperforming. Queries “1” and “3” are getting 2,721 and 1,737 impressions respectively, and are receiving little to no clicks. They seem like great candidates. After you've identified a few of your underperforming queries, click on one. This will load a new page with only metrics for this specific query. By selecting the "PAGES" tab, you’ll see the URL on your site that is displayed for this query. You now know which piece of content to optimize, and a few specific queries associated with that page which already hold prominent search position. So you’ve found your underperforming, high-potential content. Now what? The whole point of The Bike Pump Technique is to capitalize on high-potential content and improve it in every single way to maximize CTR while increasing traffic, conversion and the likelihood of earning authoritative backlinks. We have 3 key tips for pumping up your content, all of which we implemented in our own piece. Let’s help your content go from flukey to dominant in SERPs! There are numerous benefits and SEO ramifications to creating long-form content. The original “8 Statistics” post was 355 words. The new one is 2,749 words. Is a higher word count the ultimate magic formula for creating these types of results? But it does serve as a vehicle for the achievement of that formula. Longer content gives you more space to make your content useful and comprehensive—two characteristics that were seriously lacking in our original 355 word piece. By simply rattling off statistics, we were losing out on a great opportunity to engage readers and offer some perspective on the information we shared. By offering a greater degree of comprehensiveness, our new, long-form version of the piece is able to capitalize on multiple important search signals that Google looks for when defining search rankings. Namely, dwell time and bounce rate. Longer content takes longer to read, which increases the time users spend on your page. The longer users stay on your page, the more Google will reward it in search rankings. Bounce rate is a standard measurement of how often people leave your site after viewing just one page. Bounce rate is not only an important search signal to Google, it also correlates with user engagement. A longer piece of content, if done well, provides users with more opportunities to engage, often keeping them on the site longer and leading them to view additional pages (or even better, fill out a contact form, give you a call, or link to your content). Look within your content for areas you can easily expand upon with more in-depth, useful content. Here’s the original “8 Staggering Statistics” post, in its entirety. The fact that I can fit a screenshot of it in another blog post is, in itself, an indictment on the the original post. Nevertheless, the fact that the original content already exists gives you a head start based on its success. For example, we realized that there were more than 8 useful statistics out there about responsive web design. We landed on 13 great ones that proved our point and then elaborated on each one to discuss its real-world implications. This will help you capitalize on those search signals we mentioned earlier, while giving you the opportunity to be comprehensive. We realized that providing 13 statistics with great summaries was a move in the right direction, but it wasn’t enough. We decided to be more comprehensive on topics like “What is Responsive Web Design?”, “Responsive Design vs. Mobile Friendly,” and “Mobile-First Indexing” to add an educational component to the piece. Now that you’ve learned how to improve your content by expanding its length, utility and comprehensiveness, let’s move on to keywords. By sheer logic, we can extrapolate that a 2,749 word piece probably has room for more keywords than one with 355 words. And no, more room does not mean opportunities for keyword stuffing, it means natural opportunities to incorporate relevant keywords with high traffic potential. By adding more depth to the piece of content and conducting research on high opportunity keywords. Keyword research is a quick process and will help you find what you need to get your piece ranked for more keywords with high traffic potential. First, let’s take a look at the keywords your original piece is ranking for and pick out the ones generating the most impressions and traffic. Let’s say you’re writing a piece about “Technical SEO” and your piece got ranked in the top ten for the keyword “SEO Tips.” Impressive! Start by firing up The Google Keyword Planner. If you don’t have a Google AdWords account you can easily create a free one (which will allow you to use the keyword planner) following the link above. You’ll land on a specialized search. This allows you to enter a keyword and search for related keywords you may be able to incorporate in your piece. We want to find keywords that present high traffic potential. We can now scroll through and look for keywords with low competition that get between 1K and 10K searches per month. At the bottom of this chart, we see a cluster of low competition keywords with high traffic potential. “seo solutions” and “seo process” look like they could be a great fit to incorporate into the new piece. There will be plenty more relevant keywords, so you can go through the remainder of the results and create a list of keywords to incorporate in your piece. When expanding a piece of content, you can use this research to inform the direction the content will take. If you are struggling to find topics that add depth and comprehensiveness to your content, let keywords help you with the decision. After all, they represent the types of information people are actually searching for! Whenever possible, it’s best to take the guesswork out of the content creation equation. This is a quick tip but a great one. Google uses an algorithmic process called Latent Semantic Indexing (LSI) to determine relationships between similar keywords in a piece with related meaning. If a user searches for “seo tips” and your content contains the keywords “seo tips”, “seo advice”, and “seo techniques” throughout the post, this gives Google more confidence that your piece is more relevant to the search query. It also serves as a sign that you are not keyword stuffing, since the presence of LSI keywords throughout the piece reinforces the relevance of each given term. Another significant benefit lies in the fact that while Google identifies LSI keywords as pertaining to the same concept, they are still different keywords. Therefore, they present you with the opportunity to increase your traffic potential if you include them in your piece. Let’s say you’re a historian and you run a blog on Ancient Roman history. One of your posts is about the life of a Gladiator in Ancient Rome. Because “Gladiator” is an extremely popular movie, Google may have trouble determining the context of your post as an unrelated historical piece if you don’t make use of LSI keywords. Instead, if you include keywords like “Roman gladiator facts” or “types of gladiators” as opposed to terms like “Russell Crowe” or “Ridley Scott”, Google will understand your post is not connected to the movie. This helps you get more relevant traffic, as Google will know not to include you in searches related to the movie. Got it? Good! Now let’s learn how to find LSI keywords. This one is so easy it will take you about 30 seconds. You’ve got information on similar queries users are searching for straight from the source. Go ahead and incorporate any of these keywords you deem relevant into your piece. LSI Graph is an awesome tool that allows you to type in a keyword and see a corresponding list of LSI keywords. You’ll be presented with a great list of LSI keywords to use in your piece. Feel free to use both strategies to find LSI keywords and they often come up with different (equally good) results. Optimizing a page’s technical SEO is one of the fastest ways to drive increases in clicks and an improved CTR. After implementing The Bike Pump Technique, our new piece of content experienced a 45% increase in CTR for keywords with first page rankings. Couple that with the fact that the new piece got 210% more keywords ranked on the first page and the 45% improvement becomes even more impressive. Here are a couple key actions you can take in the realm of technical SEO for immediate improvement. Google usually cuts title tags off at around 60 characters, meaning people were not seeing the entire title in SERPs. That’s a great way to lose people’s attention. Google cuts off meta descriptions at around 155 characters, meaning it’s wise to use all or most of that space to create an enticing description of your content. Google is currently testing meta descriptions of up to 300 characters, but the process is still in development. In either case, 58 characters is way too short for an effective meta description. 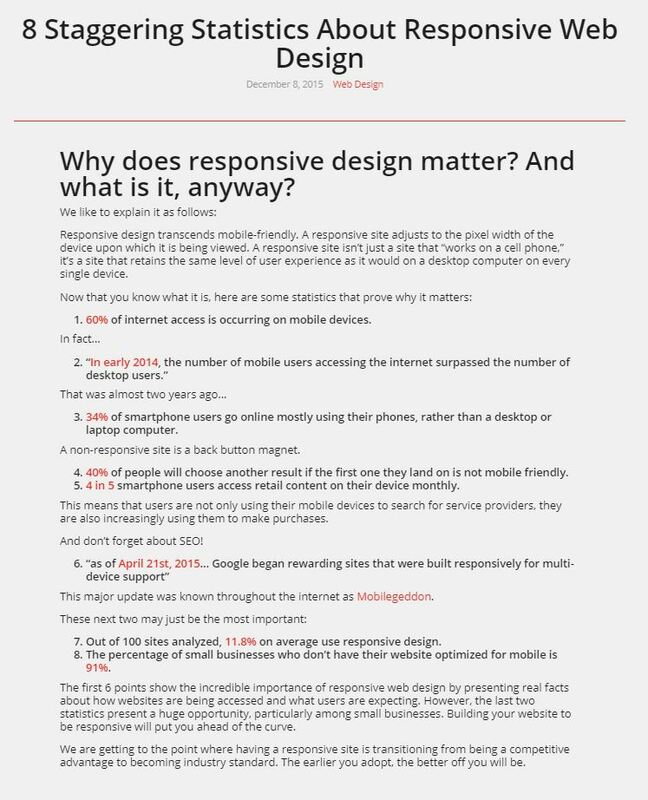 “Why does Responsive Design matter? And what is it, anyway” doesn’t do a great job describing the contents of the original post. Most importantly, it fails to draw a user in with an emotionally driven value proposition. The title tag is right on the money at 54 characters. The meta description is longer and more detailed, offering a much more compelling draw, urging users to learn about the consequences of not adopting responsive design. Google will also automatically bold the words in your meta description that appear in the search query, indicating the relevance of the content to users and further incentivizing them to click. Improving your title and description tags is the easiest part of The Bike Pump Technique, and it often leads to sharp improvements over a short period of time. The best way to ensure no one will like your content is by making it look dull and boring. Adding a design element in the form of custom graphics and visual aids to your new piece of content can have a massive impact on the success of the piece. For example, while our original piece was dull and boring, we added some design elements to spice up our improved content. 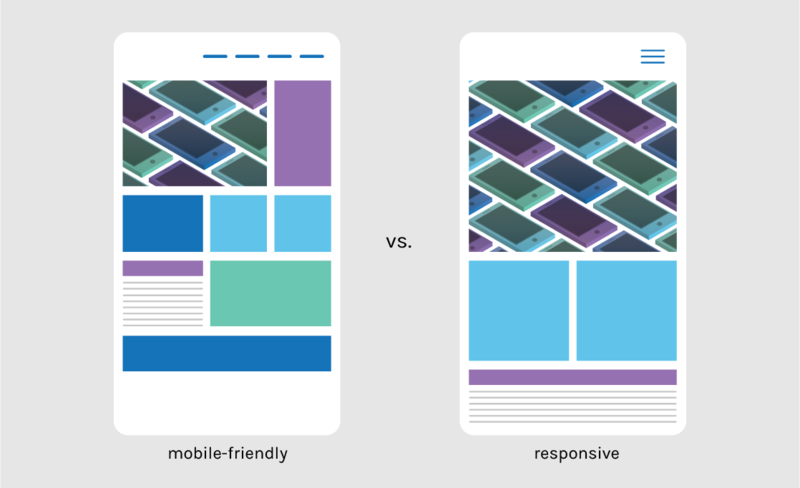 We created this custom graphic as a visual aid for understanding the differences between responsive design and mobile friendly design. You don’t even necessarily need to create custom graphics to enhance your piece. Sometimes, adding color or improving formatting to emphasize certain sections of the content can have a big impact. We did this by placing our statistics on tiles of alternating color, but there are many ways to make content pop without having to hire a graphic designer. Scour your piece for opportunities to provide visual reinforcement. Whether in the form of custom graphics or visual aids, it will add a dimension to your content that makes it more memorable, easier to comprehend, and more engaging. Another great option is to add visual evidence to your piece. If your content is a step-by-step guide or a case study, add screenshots or images that can help the reader visualize the context of what you’re covering. If you aren’t a graphic designer or don’t have access to one, useful screenshots and images are an excellent tool for adding a visual dimension to a piece of content. Once you’ve applied The Bike Pump Technique and launched your new-and-improved content, it’s time to watch the results pour in. This is the fun part, but it doesn’t mean you get to stop paying attention! Ongoing measurement and analysis is critical for spotting new areas for improvement and determining the effectiveness of your optimization efforts. Fortunately, Google offers a number of platforms with robust tools for free. Using Google Sheets in conjunction with the Search Analytics for Sheets add-on, you can easily import and work with Search Console data in a spreadsheet environment. With the use of spreadsheet functions and conditional formatting, you can perform a wide variety of analysis and present the data in a clear manner. 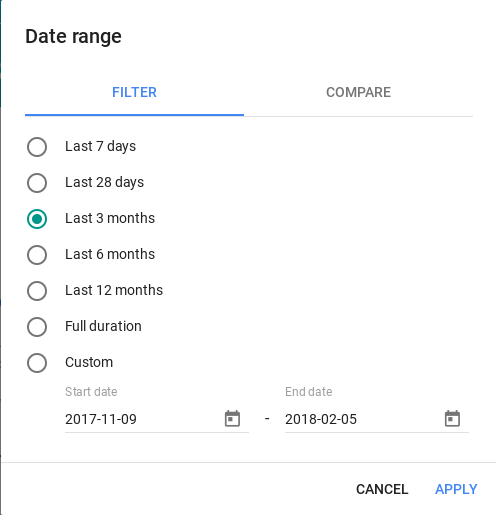 For ongoing monitoring with limited manual action required, it’s helpful to set-up a dashboard in Google Data Studio. As both Search Console and Data Studio reside in the Googleverse, they are highly compatible with one another. 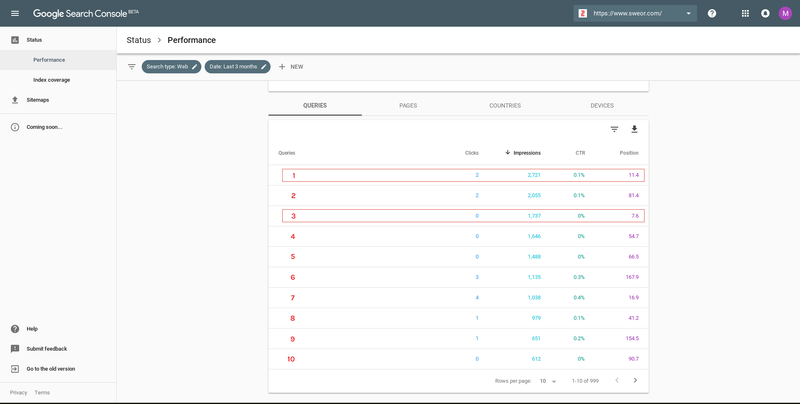 After adding your desired Search Console property as a data source in a Data Studio dashboard, you can present that data in a variety of ways. 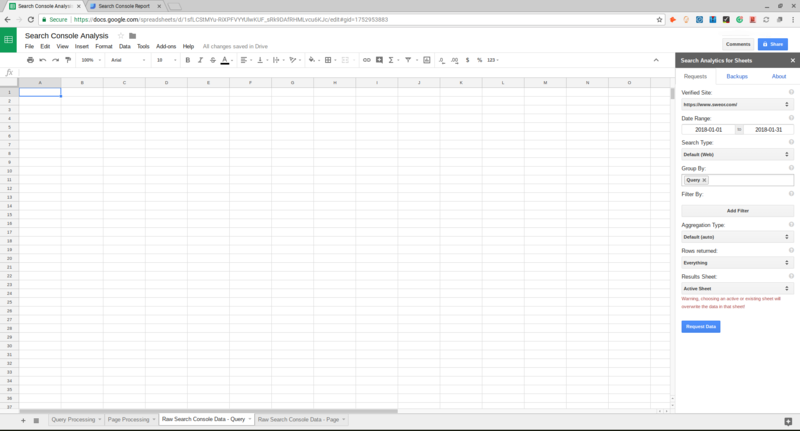 Tables, graphs, and scorecards can all be generated using the Search Console data source within Data Studio. 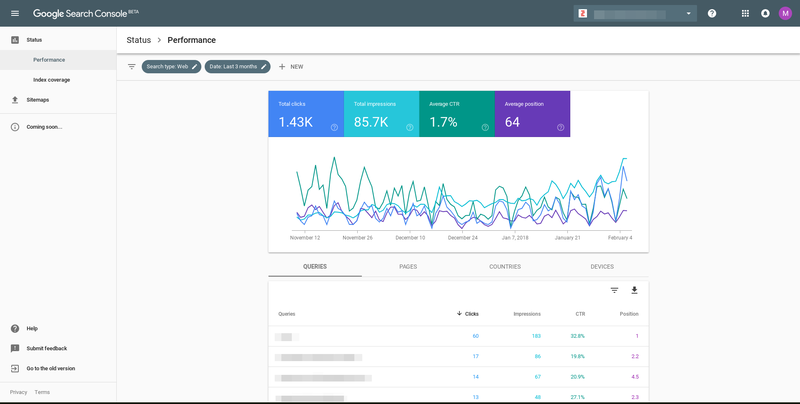 The report will automatically update as long as the Search Console data source remains connected to your Data Studio dashboard. Just because you used The Bike Pump Technique on a piece once doesn’t mean you can’t use it again to make that piece even better over time. A high-performing piece of content is a major asset to your Content Marketing and SEO efforts. Your time is better spent improving already great content than it is creating content for the sake of always having something new in the queue and up on your blog. Does this mean you should stop creating new content and only improve the old? It just means you should focus on squeezing every benefit you can out of the great content you’ve already created. You’ve put a lot of effort into rewriting and improving one of your high-potential content outliers—but you won’t truly know exactly how users will interact with that content until the page has been up and running for about a month. That’s why it’s always smart to take an in depth look at ways in which you can further optimize your new content for conversion 30-60 days after you launch it. Does your content give you an opportunity to create support pieces that users can download or directly implement? If your content houses statistical information, why not create an infographic that users can embed into their own site (including a backlink to your own site, of course)? If your content has a step-by-step process or a checklist, why not create a shortened PDF version users can download and use? You’ll be able to tell pretty early on if users are engaging with your content. If they’re not, your CTA may not be strong enough. There are plenty of ways to improve a CTA, from adding a newsletter signup or a contact form to asking users to engage in a “Comments” section. Ultimately, user behavior on your content will help you understand what may be lacking. A/B Testing is a great way to test out more than one strategy at the same time. With A/B Testing, you can modify and modify an aspect of your content and present two different versions of it to the end user. This allows you to compare the two versions and ultimately adopt the more effective solution. Google has a great free tool for implementing A/B testing. They can help transfer link juice you’ve earned from backlinks to your content to other pages on your website. They can provide more detailed and comprehensive information or evidence on topics you discuss in your content. Most importantly, they increase the likelihood that users will spend a longer period of time on your site and view more pages (both of which are important search signals to Google). You can also try adding a “Related Posts” section at the bottom of your content, keeping your users engaged by encouraging them to view complementary content. The Bike Pump Technique is for everyone. Every website with a body of content work—whether it gets 100 or 100 million impressions per month—can stand to benefit considerably from improving its high-potential content. By using the technique, you can drive significant improvements in traffic and conversion without having to create brand new content—all in less than a month. You’ve learned how to find your high-potential content outliers. You’ve learned actionable tips for turning those pieces of high-potential content into SEO and Content Marketing powerhouses. And you’ve learned how to analyze results over time and consistently improve, while optimizing for conversion. What are you waiting for? Get pumping! If you found this post to be valuable, please share on Facebook or LinkedIn! Want to be the first to receive more great actionable tips on improving your website, SEO and Content Marketing? Sign up for our email list!